Here at Decor Systems we are always looking forward. Whether it be for new products, new people to work with us on our journey, new equipment to make us more efficient, or new and innovative ways to go to market, the quest and desire to remain market leaders means we never give up. However, a project we have just recently completed has given me cause to look back somewhat nostalgically for a moment. 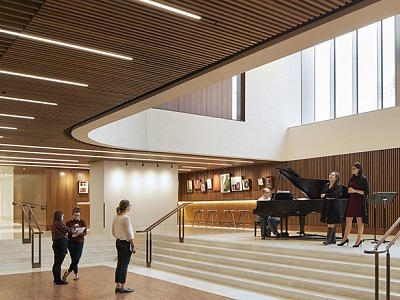 The Royal Opera House in London features a substantial quantity of DecorSlat acoustic panel systems. When I saw the photos of this stunning project it brought to mind work that my father did at the Sydney Opera House when it was under construction in the late 1960s. And back in 2016, Decor Systems Australia was honoured to supply a large quantity of bespoke DecorLini acoustic wall linings to a refurbished theatre in the Sydney Opera House. It brought home to me that while change and progress is the order of the day in these times of ever-increasing compliance, some things don’t change. It is a privilege to work on continuing ongoing projects at world-famous iconic buildings. Our heritage here at Decor Systems Australia combined with our zeal for further development and growth means that the knowledge that has been handed down from earlier generations in our history will stand us in good stead for the future. It has been an exciting journey. Please join us for the ride!